The majority of powered model airplanes use a propeller as part of their power system, and electric models are no exception. Some models use a ducted fan to simulate jet flight, and some even use propane or kerosene powered turbines (real jet engines). There are also a very few models that use flapping wings as a source of motive power (known as ornithopters). However, propellers are still the most efficient way to power a model. In short, a propeller moves air. It converts the torque of its power source (a motor or engine) into thrust, and the rotational speed (rpm) into linear speed. The combination of an electric motor and a propeller turns current (Amps) into thrust and voltage into speed. There are two values that express the most important characteristics of all propellers: diameter and pitch. The diameter is really the diameter of the circle in which the propeller rotates. This corresponds to twice the distance from the center of the propeller hub to the tip of one blade (for a propeller with an even number of blades, that’s just the distance from tip to opposite tip). Slicing the end off of a propeller blade reveals an airfoil just like that found on a wing. Different propellers use different airfoils. Some modern electric flight propellers have undercambered airfoils. This glow propeller has a flat-bottomed airfoil. Although the measure of pitch treats the propeller as if it were a screw, one shouldn’t think of it as an airscrew (the name of a certain model airplane prop manufacturer notwithstanding). It is really a rotating wing, and if you were to take a propeller and slice it across the blade, you’d see a typical airfoil cross-section. The size of a propeller is usually expressed in the form diameter x pitch. For example, an 8×4 propeller has an 8 inch diameter and 4 inch pitch. As a very rough approximation, the diameter of the propeller controls the thrust produced, and the pitch controls the speed of the air leaving the back of the propeller. In reality, pitch also affects thrust somewhat, but thinking of the two separately helps to envision how propeller changes will affect performance. Most propellers are labeled with their pitch and diameter, but it is possible to determine both given an umarked prop. The diameter is straightforward to measure of course. Measurements needed to determine the pitch of a propeller should be taken 3/4 of the way from the hub to the tip. To measure the pitch, lay the propeller flat on a table, measure 75% of the way from the hub to the tip, and draw a line across the propeller blade. Measure the width of the blade at this point, along the surface of the table (i.e. the width of the blade’s shadow if there were a light on the ceiling overhead). Next, measure the height of the front and the back of the blade, and compute the difference between these two to determine the height. There’s nothing magical about the number 2.36; it’s just 75% of π (pi), because we’re measuring pitch at the 75% diameter mark. The reason we measure pitch at 75% of the diameter is two-fold. Generally, the pitch of a propeller is not completely constant, varying somewhat from hub to tip to optimize it for the different linear speeds at each point along the blade. The pitch at 75% corresponds roughly to the average effective pitch of the propeller. Secondly, the propeller is sufficiently wide at 75% to allow one to get reasonably accurate measurements of blade width and height. 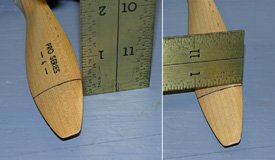 Measuring the pitch of a propeller is easily done on a flat surface with an accurate ruler. The factor k depends on the units used to express power, pitch, and diameter, and also on characteristics of the propeller such as the airfoil it uses, its overall shape, thickness, and so on. For power in Watts, and diameter and pitch in inches, k is about 5.3×10-15 for an average model airplane propeller. This formula tells us a number of things. First, it tells us that rpm is not directly proportional to power. Doubling the shaft power and keeping pitch and diameter the same will only increase rpm by a factor of 1.26 (the cube root of 2). It also tells us that increasing the pitch slightly will increase the power requirements slightly, whereas a slight increase in diameter will result in a dramatic increase in power needed to maintain the same rpm. For example, going from a 10 inch propeller to an 11 inch propeller of the same pitch would require 1.46 times the power to maintain the same rpm (11/10 to the fourth power). Or, if the shaft power were kept the same, the rpm would drop to 88% of what it was (the reciprocal of the cube root of 1.46 from the previous result). The fact that pitch affects power requirements only slightly is very important, because it means that we can make small changes in pitch to improve model performance without having to worry too much about increasing current. For example, if we have a model with a 10×7 prop that has good take-off and climb performance, but poor high-speed performance, we can switch to a 10×8 prop and only increase power required by about 14%. Assuming the motor is near its maximum efficiency point, current will also increase by about 14%, say from 25A to 29A. Larger changes in pitch should be accompanied by a slight reduction in diameter to keep the current levels reasonable. In practice, changing from one propeller to another will change both the rpm and the power. This is because changing the load on a motor shaft will change the rpm, which will change the power required, which will change the rpm, and so on. The motor and propeller combination will find a new operating point at which the shaft power produced equals the propeller input power required. Next month, I’ll talk about how motor output power is related to input voltage, current, and rpm, and how this can be mathematically connected to the propeller formula above to predict what will actually happen. As was mentioned earlier, a propeller is really a rotating wing, and as such, is subject to the same aerodynamic effects as a wing. As a propeller rotates, the blades meet the oncoming air. The angle at which this happens is a function of how fast the air is moving towards the propeller and how fast the propeller is turning. If the air were stationary, the angle of attack of a given section of the blade would be exactly equal to the blade angle at that point. The relative angle of attack of the airflow to the propeller blade depends on the rotational speed of the blade, and the speed of the incoming air flow. In reality, the air is not stationary, even if the plane is not moving, because the air accelerates before it reaches the propeller. As a result, from the blade’s point of view, the air is meeting it at some relatively low angle, which is the blade’s angle of attack. Like any wing, a propeller blade can stall if the angle of attack is too high. This can happen with a very highly pitched blade when moving at too low an airspeed. It is for this reason that high pitch propellers, like a 10×9 or 12×12 often exhibit poor performance at low airspeeds. A plane equipped with such a propeller will often exhibit poor launch or take-off performance, and then come alive once the model is up to speed. Also like a wing, if the angle is too low, no lift will be produced. A low pitched propeller on a fast plane (for example, 8×3, 12×5, etc.) can get to the point where it produces no thrust (in a dive, when gravity is providing the force to keep the plane moving). In high speed level flight, thrust from such a propeller can drop too low to overcome drag long before the plane has reached its designed flying speed. According to Astroflight’s Bob Boucher, such propellers should be relegated to stirring paint. Of course, this statement was made in the days before slow-flyer models, which often sport very large low pitch props. For many aircraft, a good compromise is a propeller with a diameter to pitch ratio of about 3:2 or 4:3 (for example, 8×6, 9×6, 10×7, 11×8, 12×8, 12×9, and so on). Such a propeller will become unstalled at relatively low airspeeds (usually below the model’s stall speed), and will remain efficient at relatively high flying speeds. In many full scale aircraft, the propeller has in-flight adjustable pitch, so that it can have a low pitch for maximum take-off thrust, and a higher pitch for optimal cruising efficiency. Some small full-scale aircraft can be fitted with one of three different propellers depending on the need at the time: low pitch for getting heavy loads off the ground but slow cruising, standard for general use, or high pitch for light loads but fast cruising. Most model propellers have only two blades because a two bladed propeller is generally more efficient than a larger propeller that produces the same thrust and air speed. A common misconception is that this is due to the blades operating in each others’ wakes, but this is only a small factor. Remember that the air in which the propeller is turning is moving away from the back of the propeller, so the wake from each blade will move backwards too, leaving clean air for the next blade to bite into. A reasonably pitched propeller would have to have a large number of blades before they start interfering with each others’ air. That being said however, a multi-bladed prop does have more induced drag caused by tip vortices (air spilling over the blade tips, just like wingtip vortices on a wing), because there are more tips. So, overall efficiency is lower, in much the same way that a biplane (even one without struts and bracing wires) is less efficient than a monoplane with the same wing area. A multi-bladed prop often has a larger total blade surface area than the equivalent larger two-bladed prop, further reducing efficiency (due to parasite drag). For best performance, reduced noise, and increased motor life, all propellers should be balanced before use. I use a Top Flite magnetic balancer, which due to its nearly frictionless bearings, will show even the slightest imbalance. Multi-bladed propellers do have the ability to turn power into thrust and airspeed in less space than a larger two-bladed prop though, which makes them advantageous when ground clearance is an issue (or fuselage clearance for wing or pylon mounted propellers). As electric flyers, balancing a propeller is very important. It’s important on glow powered models too, but the result of an unbalanced propeller is a lot less apparent, due to the noise and vibration of the engine. On an electric model, an unbalanced propeller is far noisier than a balanced one. Furthermore, an unbalanced propeller wastes power, because it is putting a sideways force on the motor shaft, pushing it against one side of the bearing. It also can also cause the shaft to bend somewhat, which means the motor armature (in a direct drive application) runs off-center, further reducing efficiency. I use a Top Flite magnetic balancer, and sand material off the back side of the heavy blade as close to the tip as possible (the further from the center you remove material, the less you will have to remove). One of my direct drive models which sounds like a glow model when flown with an unbalanced prop, becomes inaudible at 200 feet when flown with a well balanced prop of the same brand. A propeller with no source of power is useless, so next month we’ll look at how an electric motor interacts with the propeller to convert electric power to the form that we need it for flight, namely thrust and airspeed. I want to thank you for the pitch explanation and measurement process. I have been looking for that answer for awhile. its too good to learn it from here!!!!!!!! Good, simple explanation of the basics! That formula is taken from Robert Boucher’s “Electric Motor Handbook”, published by AstroFlight. Helpful article sir.An unbalanced airscrew powered by a glow engine can also cause dramatic situations depending on the degree of unbalance factor and the diameter/mass of the propeller.I can’t stop myself thinking that can absolute factory prebalance be possible because most beginners do not balance their propellers.They think its unneccessary i guess.It may be ok with a cox engine maybe but if you are running an OS 140RX it can be very dangerous both for the humans and investment. can you please explain to me how propeller size effect thrust? Loreann, thrust is equal to input power times efficiency divided by pitch speed (where all units are SI). I have a Hendrickson Wood 2 blade prop. The only markings i could find are h68f82 21659 . Can anyone tell me what that means? Thanks Les. I am having trouble getting the pitch from my airfield T28 prop as it is a multi piece prop and the hub i tall there is no listing of pitch i am trying to replace it with a master airscrew when i replace the motor with a power 32 770kv from a power 25 520kv so i want to get the right prop. plane is 1400mm and about 5.5lbs. motor is a little under powered or not enough kv for prop size..is about 13in 3 blade. guessed at a 7 pitch ???? want to use original prop if possible…????? i’m looking for a cheap three blade prop 5″ dia for a de havalland beaver i’m building out of scrap for fun hanging ornament. Pitch of no importance, just needs to turn and look right, any help please? What is the relation b/w thrust and pitch of the propeller..
A very interesting and informative read ! I would like to know how to calculate thrust to payload push/pulling capacity of a propeller. Example: If I have a hovercraft that has a gross loaded weight of 600lbs. What size propeller would I need to push the craft forward at 30 miles per hour, using an 18hp gas engine? 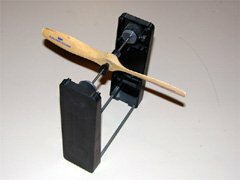 How do I determine how strong a propeller is? I am concerned about a blade breaking. How do I calculate how much weight a propeller can pull or push with out blade failure? The formula above is not for the motor hp, it’s for the power transmitted by the prop to the air. This is less than the motor output, which is simply torque times RPM. The amount by which it’s less is the mechanical efficiency=power output/(power input). Book: Marine Hydrodynamics, by Newman. MIT Press in the 1970s. The ideas apply to props in air, props submerged in water, and surface-piercing marine props. Same physics/hydrodynamics so far as power, etc are concerned. Sorry Joseph, that formula is for the power _absorbed_ by the propeller, not the power that is turned into useful thrust and velocity. Thus, it _is_ equal to the power that the motor must output. To get the power _produced_ by the propeller, you have to multiply by an additional factor that represents the efficiency of the propeller (and that factor will vary with speed, medium, etc., so it can’t be included in the constsant k). We use CF ground adjustable custom made blades in our prop hubs. These are 1/5 scale of the Corsair. I have a pitch adjusting tool I purchased from GSC of Canada, but this measures in DEGREES pitch. I need to know the equivalent in inches of pitch (and vice-versa). The length of the blade is 325 mm from the hub to the tip and I suppose to set the dial at 25% of this distance from the tip, thus 81.5 from the tip. At this point the blade is 55.2 mm wide. Is there any software that can do this conversion automatically? I am a student of the Estonian Aviation Academy. I am writing a paper on construction of a thrust stand for propeller driven UAV engines and I would like to request permission to use your image about relative angle of attack (in the chapter titled “Airflow”). one thing though.there is another article they did not take 75% of pi.and then again pi is constant for any circle .that not mean to find the pitch at the position 75% of(r) you take 75% of pi..for any circle what ever it is pi is the same pi which it is constant value ..
0.75 * pi * d = pi * 0.75 * d = 2.36 * d (approximately). Stefan, I’m trying to design a ducted fan. It’s small. It is 30mm OD. with a 12mm dia. hub leaving small blades. Does the pitch start at the hub and go to the OD ? How would you calculate the pitch ? The same formula as above? I’m thinking I could use the tangent of the chord at 75% instead of h/w ? Val, the blade should be twisted, so that the pitch is constant. So you’ll get a different angle at each distance from the hub, but the pitch should remain the same. The only reason we use the 75% point for a propeller is because the blade is typically the widest there, or near there, thus minimizing measurement error. So to compute pitch at any given distance from the centre, use pi * d * height / width where d is the distance from the centre, and height and width are as measured at that distance. Or, as you’ve noticed, you can use tan(c) instead of height / width, where c is the angle of the blade. EDIT 2019-Jan-21: That formula should be 2 * pi * d * height / width. Excellent, but still can’t grasp propeller tip stall. Can you please explain this? Any airfoil, whether of a wing or a propeller, produces lift as a side effect of the air moving smoothly over its top and bottom surfaces. If the angle at which the leading edge of the airfoil meets the oncoming air is too high, this smooth flow is disrupted (the air over the top becomes excessively turbulent), and the airfoil no longer produces any lift. When this happens with a wing, the airplane falls. When it happens with a propeller, it stops producing any thrust. hello sir, i want to know ho to calculate all the thing about propeller,i wanna to built a small propeller using pvc pipe(plastic pipe).im used pvc pipe 5 inchi .so after cutting ,i get 8 piece blade.1 blade radius is 2.5cm and long is 14 inch. Fascinated by your article. Do you know if the data you cite re: how an 11 inch propeller needs 41% more power than a 10″ propeller of the same pitch to turn the same rpm also applies to small aircraft. I own a grumman cheetah which left the factory as the 150hp version of the 180hp grumman tiger. The modern props for us are both Sensenich, but the cheetahs is 72.5″ and 61″ pitch, and the tigers is 76″ and 61″ to 65″ pitch. Any idea how much of the extra 30 hp is being used by the 3.5″ longer prop? I expect that it does apply to full scale propellers too. With power (for a fixed rpm) being proportional to diameter4, a 76″ prop should take (76/72.5)4 times as much power as a 72″ prop. That works out to 1.21 times. 180hp is 1.2 times 150hp, so the prediction is pretty much right on. Thanks, Stefan. This is an excellent article about the fundamentals in terms a layman can grasp. The terminology we use is important. I liked (and use myself) the term “geometric pitch” as Agus used in his comment. And when I began measuring in the method you describe I measured the hypotenuse rather than side B for the simple reason that my caliper can nail it to .001 inches. I use the term “bite” for side “a” and the term “sweep” for side “B” which you described as the shadow the blade would make if lit from above on the table. I will be sending links to this article for folks to read who are interested in discussing the nuances of measuring their own propellers! Thank you Stefan. I found your article very useful. Hy, fantastic work , congratulation. The part “of the same diameter” is wrong and stucks with the goal. Thanks for catching this! I’ve corrected it to read, “of the same pitch”. I took propeller 12”x 6”(Pitch). But when I used ur formula to measure pitch I got something around 1.6 pitch. I don’t understand how come measured pitch is different from whats it written in propeller. Also, in the pitch formula the units got cancel as same units (hight/width). Perhaps you made a measurement mistake, or the propeller isn’t of the stated pitch. What brand of propeller is it. What were the measurements? Yes, the units of height/width cancel, resulting in a ratio which is then multiplied by 3/4 times pi times the diameter (e.g. 12″), giving a result with the same units as the diameter (e.g. 6″). I wonder what this line means “The combination of an electric motor and a propeller turns current (Amps) into thrust and voltage into speed.”? Please give me some insights on this analogy. The way an electric motor works, more voltage results in more speed, and more load on the motor (“thrust”) results in a higher current draw. Of course, the two are interrelated, since increasing the voltage generally also increases the load (because whatever is connected to the motor becomes harder to turn the faster you turn it). Could you please provide a formula for thrust calculation generated by Prop Blades in terms of Rpm of a propeller blade, blade angle? AS well as if we have a variable pitch propeller what will be the forces require to change the pitch? This two-question helps me a lot for my study. A propeller doesn’t have a specific blade angle. The angle varies as you move outward from the hub. The amount of force required to change the pitch would probably vary with the pitch, how fast you want to change the pitch, and numerous other factors. At higher altitude, what you want is a larger diameter prop. The air density is lower, which means you need to move more air to get the same amount of thrust (since the quadcopter still weighs the same). However, if you don’t have room for a larger propeller, a 3-bladed one might help. Sir i have find that the pitch of 1045 propeller is 4.5 inch in google ,then i do some calculation to find thrust.But that is wrong.firstly rpm and thrust i find practically.Now by applying your pitch formula the answer is approx right.But sometime i thought that 4.5inch is the pitch of one prop.I am totally confused where i am wrong.please give me answer as soon as possible. Anant, I’m sorry, but I don’t quite understand what you’re asking. You said you did a calculation and it was wrong, and then you did a calculation and it was right. But yes, a 10×4.5 propeller has 4.5 inches of pitch. I’m confused because (2.36 * diameter) seems to be more than (pi * distance) when measured at the 0.75 mark. Why are the two formulas not equal? What am I doing wrong? You are correct. The formula I gave Val should have been 2 * pi * distsance * (height/width). I have added an edit to the original comment. Some of Top Flite props have a designation 18×6-10 (part number TOPQ5216)! Do you know what these THREE numbers mean? Also, Vess props have a 23A and 23B prop. As far as I can see by performance data (From forum: FlyingGiants > Gas Engines > Real world rpm), a 23A prop is close to a 23×8 prop. So does A = 8, B = 10 etc? Finally, (see thesis SMALL-SCALE PROPELLER PERFORMANCE AT LOW SPEEDS by JOHN BURTON BRANDT, B.S.E., Arizona State University, 2003), Brandt chose to ignore Top Flite, Vess and wood props. The highest efficiency prop was the APC thin electric 17×12 at 69%. Unfortunately, there was no analysis of the prop geometry to the prop performance so as to show what constitutes a good prop. From what I recall, the Top Flite props have non-constant pitch, with lower pitch at the tips for higher thrust at low speeds. In my opinion, it’s marketing mumbo jumbo. What you have is a prop that’s not ideal at any speed. I’ve never heard of Vess props before, but if they choose not to follow standard conventions for labeling their props, then I can’t take them seriously. Everyone else uses the DxP convention, from the tiniest model airplane prop manufacturer to the makers of full-scale propellers. Great Artice thanks Stefan. I’m a little confused though regarding your mix of ‘diameter’ and ‘radius’ when measuring ‘pitch’. 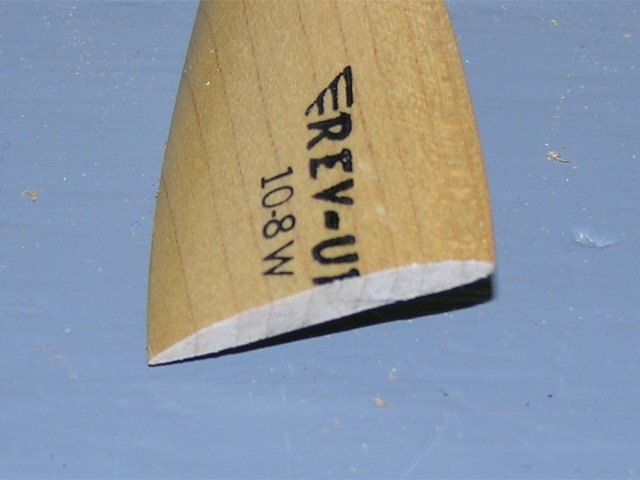 The “75% of the distance from the hub to the tip of the prop” is to find the spot at which to measure the blade width and height to determine the pitch. The formula expressed in terms of diameter is still correct.